Line a cookie sheet with parchment paper and set aside. In a mixing bowl add first four ingredients and mix well. Stuffed each jalapeno halves with chicken mixture nice and tight until out of chicken mixture. Place stuffed jalapeno n cookie sheet and place in freezer for 20 minutes. Add the Flour in one bowl, the eggs in a second bowl and the Italian bread crumbs in a third bowl. 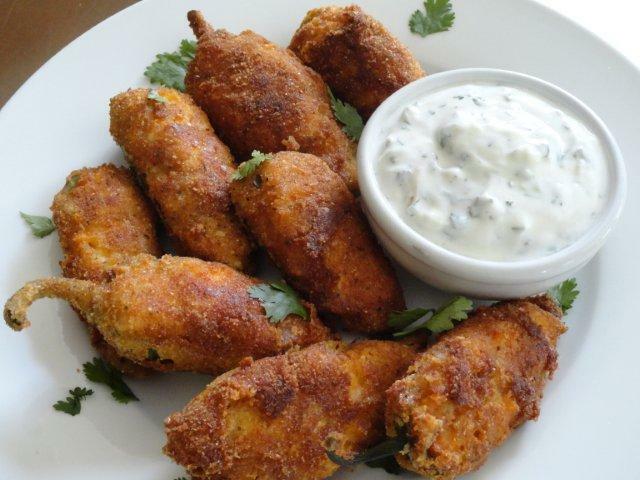 Take the stuffed jalapeno out of the freezer and dip in flour than in egg mixture and than in Italian bread crumbs to form a nice crust all the way around the jalapenos. On stovetop in a frying pan add oil and heat to 365 degrees. Place half of the jalapeño peppers stuffing side down in oil and fry for about 7 minutes turn and fry an additional 5 minutes until nice and golden on both side places on paper towel to drain excess fat. Repeat for second batch. Let jalapeno rest for 5 minutes. Hi everyone cold and windy weekend after weekend so no fishing rough seas out there so stew it is to warm us up this is a lighter stew because I use chicken and white wine but very filing and will most definitely warm your bellies up!! On medium high heat on stove top add ¼ cup oil to a Dutch oven. In mixing bowl mix flour, salt and pepper add chicken cubes to flour and coat chicken well. Add chicken cubes to the Dutch oven but do not crowd the pan and braise chicken cubes in olive oil on both sides just until a nice crust forms on the chicken you may want to do this in two batches. 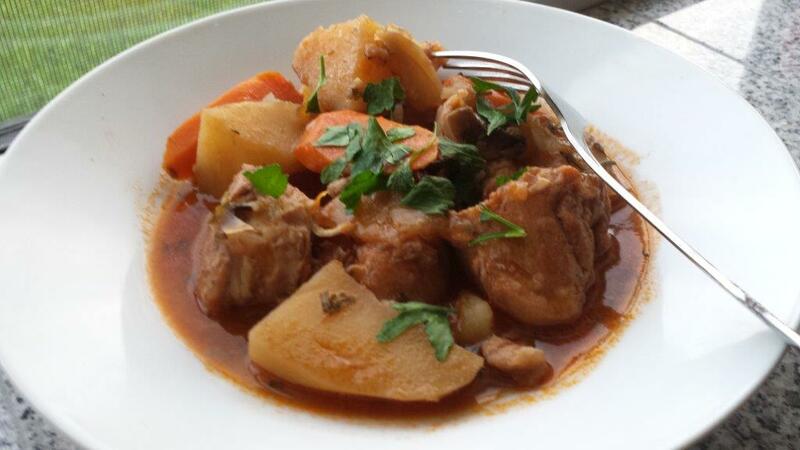 To the braise chicken add tomato paste, carrots, potatoes, mushrooms, rutabaga, onion and parsley. Mix until chicken and veggies are well coated with the tomato paste. Add chicken broth, wine and rosemary. Bring to a simmer, cover and cook for 2 hours or until vegetables are fork tender. Brrrrrrrrrrrrrrrrrrr no fish recipe today we need soup to warm us up during this super cold weather! 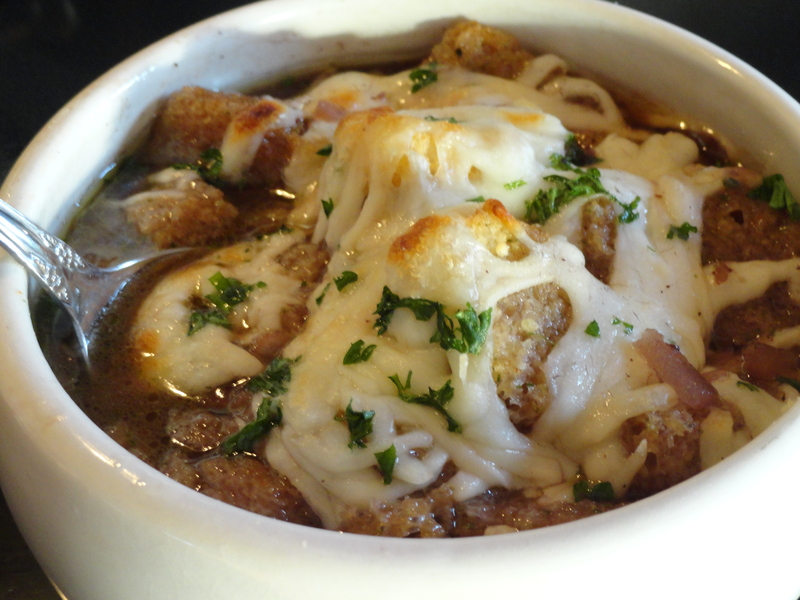 This is a traditional French soup I grew up with that I love so much. With today’s busy life I made it into a simple anytime of the week dinner served with a salad. Even though it’s done in 30 minutes or less you still smell that wonderful long cooked French onion soup that we all love so much! Bon Appetit! On stove top on medium high add to a medium pot onion soup mix, water and dry red wine. Simmer for 10 minutes. While soup is simmering on medium heat in a non stick frying pan add oil, butter, 1 teaspoon oregano, onions and garlic sauté until they become translucent. Add to broth and simmer additional 10 minutes. In 4 small crock separate the soup equally top each with equal amount crouton and mozzarella cheese sprinkle with remaining oregano.